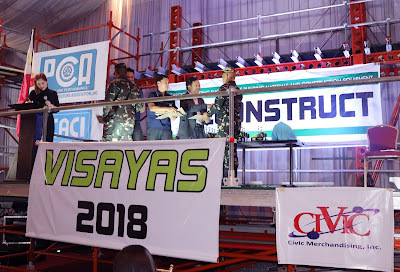 The Construction Industry Authority of the Philippines, through the Construction Manpower Development Foundation was recognized by the Cebu Contractors Association, Inc. and the Association of Carriers & Equipment Lessors, Inc. as an industry partner for Philconstruct-Visayas. The expo which ran from 7-9 June 2018 in Waterfront Cebu City Hotel was attended by key industry leaders, government officials and construction stakeholders. As industry partner, CMDF conducted 4 Professional Regulation Commission (PRC) accredited programs for the event namely the PMB Asphalt Seminar, Guidelines for the GREEEN (Geared for Resiliency and Energy Efficiency for the Environment) Building Rating System, the Industry Supported Technical Enhancement Seminar for Formworks and Scaffolding, and the Safety Seminar for Workers. As the construction human resource development arm of the Construction Industry Authority of the Philippines (CIAP), CMDF understands the need to work closely with the industry to further boost the competency and skills of people working for the construction sector, the Industry Supported Program is a new partnership template developed by CMDF to enhance collaboration with industry partners. CMDF will continue to explore different avenues to support the Build! Build! Build! program of the government by equipping our manpower with knowledge and tools to safely deliver high quality results on time.